When we first start testing for a piece, it is very important to keep an open mind and not presuppose any end-results. Ideally we would go double blind, but in the tech review industry that is not always possible. We knew the results from our DDR3 testing showing that outside of integrated graphics, there are a few edge cases where upgrading to faster memory makes sense but avoiding the trap of low base memory can actually have an overall impact on the system - as long as XMP is enabled of course. Because Haswell-E does not have any form of integrated graphics, the results today are fairly muted. In some ways they mirror the results we saw on DDR3, but are more indicative of the faster frequency memory at hand. For the most part, the base advice is: aim for DDR4-2400 CL15 or better. 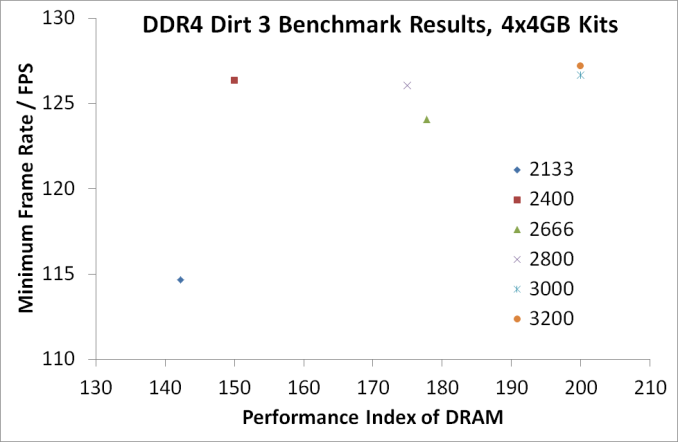 DDR4-2133 CL15, which has a performance index of 142, has a few benchmarks where it comes out up to 3-10% slower than the rest of the field. Cases in point include video conversion (Handbrake at 4K60), fluid dynamics, complex web code and minimum frame rates on certain games. For professional users, we saw a number of benefits moving to the higher memory ranges, although for only very minor performance gains. Cinebench R15 gave 2%, 7-zip gave 2% and our fluid dynamics Linux benchmark was up +4.3%. The only true benchmark where 2800+ memory made a significant difference was in Redis, which is a scalable database memory-key store benchmark. Only users with specific needs would need to consider this. There is one other group of individuals where super-high frequency memory on Haswell-E makes sense – the sub-zero overclockers. For these people, relying on the best synthetic test results can mean the difference between #5 and #20 in the world rankings. The only issue here is that these individuals or teams are often seeded the best memory already. This relegates high end memory sales to system integrators who can sell it at a premium. Personally, DDR4 offers three elements of interest. Firstly is the design, and finding good looking memory to match a system that you might want to show off can be a critical element when looking at components. Second is density, and given that Haswell-E currently supports four memory channels at two modules per channel, if we get a whiff of 16GB modules it could be a boon for high memory capactiy prosumers. The third element to the equation is integrated graphics, where the need for faster memory can actually greatly improve performance. Unfortunately we will have to wait for the industry to catch up on that one. At this point in time, our DDR4 testing is not yet complete. Over the next couple of weeks, we will be reviewing these memory kits individually, comparing results, pricing, styling and overclockability for what it is worth. 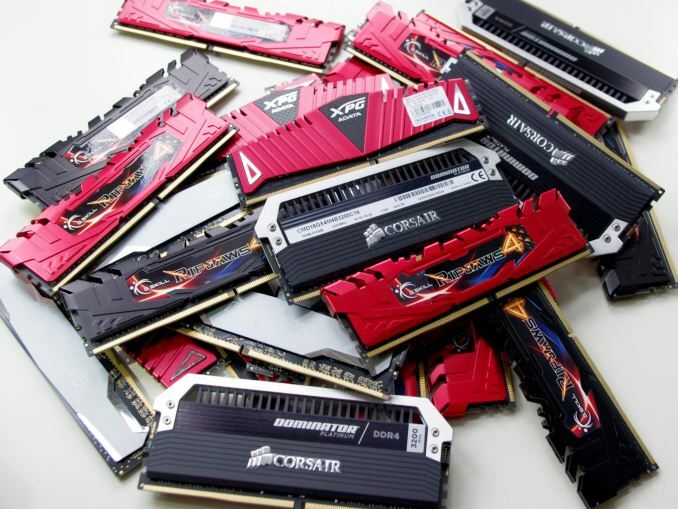 Our recent array of DDR4-3400 news from Corsair and G.Skill has also got some of the memory manufacturers interested in seeing even higher performance kits on the test bed, so we are looking forward to that. I also need to contact Mushkin and Kingston and see if those CL12/CL13 memory kits could pose a threat to the status quo. Edit: Mushkin actually emailed me this morning about getting some product for review. We have a couple of updates for our testing suite in mind as well, particularly the gaming element and are waiting for new SSDs and GPUs to arrive before switching some of our game tests over to something more recent, perhaps at a higher resolution as well. When that happens, we will post some more numbers to digest. well do you really need additional CPU power? My overclocked E8500 (with stock cooler) was a beast, there was so much headroom, and I didn't change computer because of it. Right now I'm on a i5 750 from 2009 or something and it's totally fine. Also my GTX 275 still handles games in full hd just fine although not at max settings and it also becomes hot and only has DX10 so it's obsolete. So after 6 years, it's only the GPU that could use upgrading, the CPU/RAM part is not bottlenecking anything. Well not having sata 6 and that limiting my SSD is the one bad thing. I don't have any USB3 pendrives so I don't miss that. Nice post. I had an E7300 system and I had already upgraded the GPU to a GTX 760 and maxed out memory. It was somewhat slow in the newer games I played (Call of Duty), then I bought an E8500 on ebay and put that in and overclocked it finding a sweet spot, but it was still not quite as fast as I wanted. The poor optimization of COD Ghosts was partly to blame, but I ended up redoing the whole system at that point.